California has a rich history of diversity, collaboration, and innovation. We have a diversity in landscapes and resources which fostered growth and prosperity. In looking at what has come before, we are far more prepared to address what is to come. 2018 -2019 school year will find me teaching 4th grade for the 3rd year in a row. I am exciting to see what is to come. 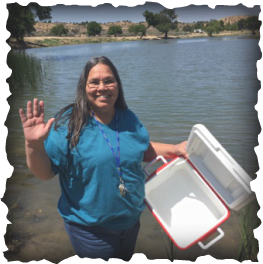 ​2016: This is me at Mojave Narrows dropping off our Trout, which needed to be released early due to survivability. I am a born and raised Californian. The beauty and diversity of the people and landscape never ceases to amaze me. On these pages you will find links for a variety of endeavors, including research, science and homework help. Part of the amazing Adelanto Elementary School District, Gus is an amazing school to work at. This coming year will be my 4th year with the school district and I am looking forward to an exciting year. Trout in the Classroom, Project Lead the Way, Science, Writing, exploration and art are all part of what is planned for my students this upcoming year.